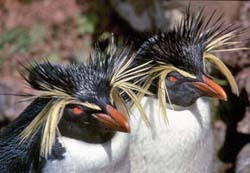 Known by Tristan Islanders as Pinnamins, Northern Rockhopper Penguins breed in rookeries throughout the Tristan archipelago. 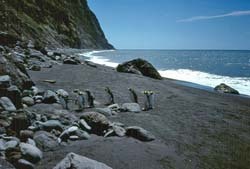 This photograph shows Pinnamins coming ashore to feed their young at the Jew's Point Tristan da Cunha penguin rookery, the first to be established as a Nature Reserve in the 1980s. Here penguins have easy access to the grey sand beach, but their rookery is on shelves in the exposed Morgie's Gulch, normally dry, but liable to flash floods during heavy storms, when a raging torrent may wash down boulders and threaten their nest sites. Pinnamins come ashore to breed in August, gathering in rookeries and laying 2 or 3 eggs in September . 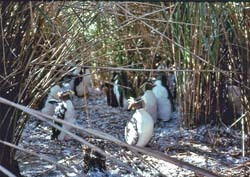 Islanders claim that only one chick hatches, and traditionally gather penguin eggs to supplement their September diet. Under the 2006 Conservation Ordinance, eggs may now only be harvested from Nightingale, Middle and Stoltenhoff Islands. Chicks hatch in October and remain in the Tristan rookeries until they depart in December or early January . Pinnamins prefer the shelter and protection of Spartina tussock grass which form the rookeries on Gough, Nightingale, Inaccessible, Middle & Stontenhoff Islands. 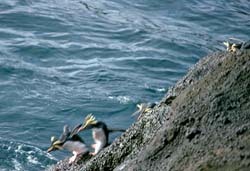 On Tristan rookeries are in gulches or under cliffs, where penguins and their young are exposed to the elements, including wind, rain, and being washed out to sea as the normally dry gulches flood. 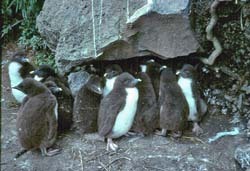 Once large enough, penguin chicks are huddled into creches (left) and protected by one or two adults while others feed. The protection is against predation from Sub Antarctic Skuas, who prefer nesting sites close to penguin rookeries. Penguins eat krill, small fish and squid. Antarctic fur seals often gather where penguins come ashore as they are an important part of their diet. Penguins lose their buoyancy during their annual moult, and must return to shore, fat from summer feeding, to stand (as still as possible to conserve energy) for several weeks particularly during February & March , until their new, buoyant, feathers have grown. As a result, the penguin rookeries have a distinct aroma, and the peat soil is enriched with droppings, including feathers. This guano is harvested during annual longboat trips by Tristan islanders during late summer to provide fertiliser for their Potato Patches. This view of moulting penguins was taken on a February Guano Trip in the Nightingale Island tussock. Northern Rockhopper Penguins are one of the smallest penguin species, and probably the most agile. On Nightingale Island the penguins have to negotiate steep rock surfaces and it is easy to see from this shot how they got their name. 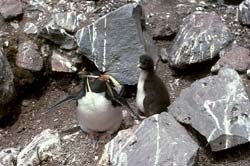 Imagine hopping back up this rock - which adults do almost every day when feeding their chicks.